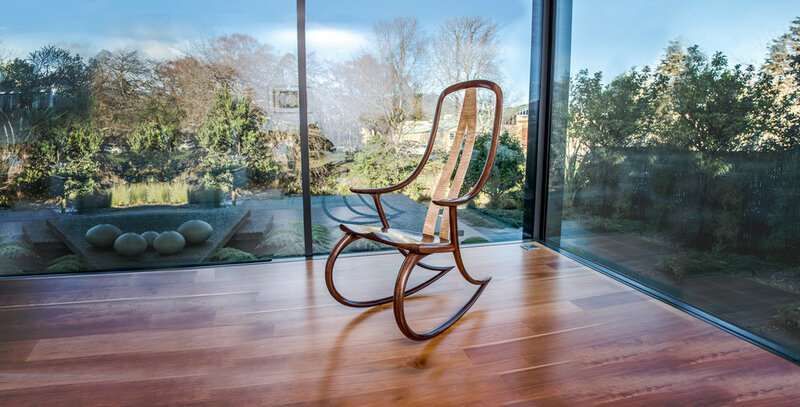 The Monogram rocking chair by David Haig is a design classic. Its interconnected curves create a supple, strong and elegant support for the human body. Built in Cable Bay, New Zealand, Monogram rocking chairs are treasured in homes around the world. They have been exhibited widely, and an example is held in the design collection of the Museum of New Zealand, Te Papa Tongarewa. View the Monogram Rocking Chair collection; English sycamore, English walnut, American walnut, and rippled maple. David Haig and the Monogram Rocking Chair design story. David Haig's workshop, set in the stunning Cable Bay, New Zealand.